On November 9th 1969 the Zodiac Killer mailed the 'Bus Bomb' letter to the San Francisco Chronicle detailing the murder of Paul Stine. In the correspondence he stated "If you wonder why I was wipeing the cab down. I was leaving fake clews for the police to run all over town with, as one might say, I gave the cops som bussy work to do to keep them happy. I enjoy needling the blue pigs". This has been thought by many to suggest the killer may have been planting fake fingerprints on the taxicab, which sounds a little far-fetched. On October 15th, only four days after the crime, the San Francisco Chronicle ran an article entitled 'The Boastful Slayer.' It stated "Witnesses said they saw the man wiping down the door and interior of the cab with a cloth." The Zodiac suggested he was leaving fake clues, but what sort of clues would make the police run all over town, and what purpose would it serve. He may have realized that the police would likely discover the approximate area he entered the taxicab, so may have wanted to throw them off the exact location by misdirecting them to a secondary location close by. He could achieve this by leaving something in the taxicab on purpose, to give the police "some busy work." Something that featured in later newspaper articles. Twelve days after the crime, on October 23rd 1969 the San Francisco Examiner ran this:"The search also took police to Nob Hill, where the Fairmont Hotel became involved again in the manhunt. This was because: #1. Cabbie Paul Stine, 29, the Zodiac's latest victim is believed to have picked up his fare on a street near the famed hotel. #2. A waitress in the hotel candy shop-fountain told police she served coffee during the television show (Jim Dunbar/Melvin Belli) to a man who resembled composite drawings of Zodiac. She saved the cup and saucer for a fingerprint check." It clearly states "the Fairmont Hotel became involved again," indicating it had previously been considered a possibility. But why? Paul Stine was returning to the theater district from the San Francisco International Airport, when he was directed by taxicab operator Leroy Sweet to a fare at 500 9th Avenue. There was no mention by anybody that Paul Stine was picking up a fare outside the Fairmont Hotel en route. The taxicab meter read $6.25 at 10.46 pm, as it rested near the intersection of Washington and Cherry, and this meter reading, along with the final contact with Paul Stine, was used to calculate his approximate position in the theater district, by Union Square. Something else must have prompted this consideration. It has been considered that the article on the right, detailing an attack on another taxicab driver, only eleven days prior to the Paul Stine murder (click to read full article), may have been the catalyst to revisit the Fairmont Hotel. However this appears not to be the case. On September 30th 1969, a Chinese Yellow Cab driver in San Francisco picked up a fare at the 950 Mason Street, Fairmont Hotel. "He was first robbed at gunpoint. Then he was forced into the trunk of his cab and locked in after his pleas that he might suffocate failed to sway the gunman. But the cabbie was found and freed by military police inside Presidio grounds before being overcome. San Francisco Captain Martin Lee explained there is an amazing similarity in MO in the two cabbie cases. Both times the drivers picked up ostensible fares in the area of the Fairmont-Mark Hopkins Hotels at night- and they climbed in alongside the drivers. Both passengers asked to be driven to Presidio Heights, in fact just three blocks from each other. Then, nearing their destinations, each one made a last minute change, in where he wanted to be taken. The descriptions of the passengers made by the surviving driver and the three children varied widely. But Captain Lee said, only partly in jest, "all Occidentals look alike to an Oriental person." The taxicab driver had been waiting in line in front of the Fairmont Hotel at 11.00 pm on September 30th when a man, who appeared to be a cook or other hotel worker came up. He hopped in the front and asked to be taken to Washington and Locust Streets. The cabbie later asked the fare if he worked in the Mark Hopkins. He replied tersely "yeah". Near the original destination the passenger told the cabbie to drive down to Arguello and into the Presidio." The crucial part is "Both times the drivers picked up ostensible fares in the area of the Fairmont-Mark Hopkins Hotels at night-" This indicates that the September 30th case was not the catalyst for investigators to consider the Fairmont Hotel in the Paul Stine murder, but was separate and independent of it. The Fairmont Hotel clearly generated no leads we are aware of, but what drove investigators to consider this pick-up point as a viable option in the Paul Stine murder case. As stated above, the Zodiac Killer knew that investigators could backtrack his approximate location to the theater district, so possibly had to throw them off his scent by offering an alternative area of interest, in line, and not widely in conflict to the taxicab meter reading. The Fairmont Hotel and Union Square/Mason and Geary Street areas, are virtually the same distance to the Washington and Cherry intersection. Often the police withhold details of a crime to verify future correspondence from the killer. Captain Martin Lee would allude to this in a KPIX news report on November 12th 1969. 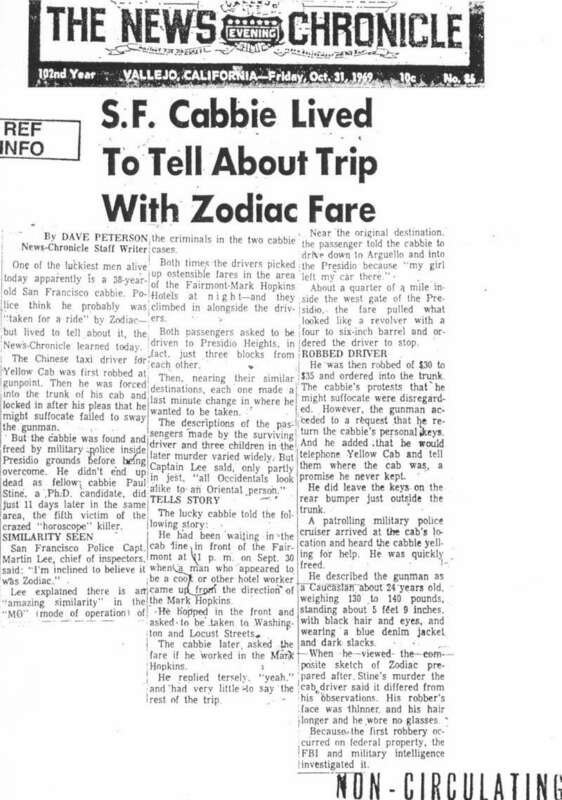 Did the Zodiac Killer deliberately drop "fake clews" inside the taxicab on October 11th 1969, insinuating a connection between him and the Fairmont Hotel, sending police on a wild goose chase, "running all over town," and was he aware of the previous taxicab hold-up, using it to his full advantage. Rich talking of fake clews, I've spoke to You before about the Exorcist letter appearing to foretel the end/death of Zodiac as a character or alter ego of the Person/Persons who created Him but in the Exorcist Letter He not only no longer opens with His standard, almost trademark 'This is the Zodiac Speaking' (because, in my opinion, it isn't Z speaking as in Z the character) but He also seems to change His use of English or words chosen, too. The 'Exorcist' letter may well have marked the death of Zodiac's persona. All the 1974 letters displayed a complete lack of his opening line 'This is the Zodiac Speaking', along with the trademark crosshairs. The intervening 3 years clearly resulted in some change, or the 1974 letters were all penned by a hoaxer. The English/British background is a real possibility. Either his parents or one parent may have British lineage, or he on the other hand, bearing in mind his Mikado references, may have theatrical training or exposure to productions with British leanings, such as Shakespeare, where 'shall' is used commonplace. "Shall I compare thee to a summer's day?" dear Alex. "Shall I compare thee to a summer's day?" dear Alex." And as one of The founding Fathers of The FBI's Behavioral Science Unit, Robert Ressler, stated consistently about this type of Homicidal Individual that distinguishes them from all others is their inability to stop killing once they act on that first impulse to kill. Ressler said, using Jeff Dahmer as His example, that these individuals will not stop killing and while they may go from 20 victims a year to 3, they won't ever Stop and will only cease killing when You Stop them by apprehending them. Ressler's theory or general assumption that Serial's are not going to stop killing because they are driven by an insatiable need to kill that they simply cannot resist or ignore for too long a period before the urge to kill becomes all consuming. "When The Horrors of what Dahmer was doing were finally discovered, Jeff Himself said He was glad it was over and He was caught. So, is/was Zodiac a one off 'Hybrid' species or did Ressler get His theory wrong about S Killers and their non-ability to stop once they start feeding the inner monster or 'Factor X' with Victims? Answers & A Postcard comes to mind.. Although it has been stated 'shall' is predominantly used in Britain, whereas American's use the word 'will', this is not exclusive to American's as a broad brush. Shall is still used in America, and Zodiac may have been one such person.